Space Metal. That's about the only description of this album that I can imagine. 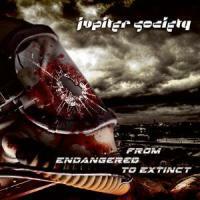 I very much enjoyed Jupiter Society's first album, "First Contact/Last Warning". It has a great mix of funky riffs, choirs, and spaciness. Yet, the production was severely marred. So, I gave this new album a listen. For those who don't know, Jupiter Society is the brainchild of Carl Westholm, vocalist for Carptree. If you've heard Carptree, you know that they are brilliantly strange, and this makes its way into Jupiter Society, as well. "From Endangered to Extinct", unfortunately, continues the series of recent albums that use the idea of an alien invasion and the resulting human cooperation as tools to show us how stupid the human race is. We shouldn't be killing each other. We are all human. While this is a great message, it's been done to death. The music, also, seems to show little progression from the very first album. Again, we have funky riffing, choirs (excellent ones, at that), weird vocals from Carl, and a total "blah" when it comes to all the other instruments. This album sounds too much like the first, only not as good. In fact, the first album has some unique songs, while "From Endangered to Extinct" omitted much of what made the other albums special. That is not to say that this album is a waste: It has some great moments, particularly on 'Invasion", "Queen of Armageddon", and "Fight Back". But for everything great moment, there is an even more cliche moment. For instance, on "Fight Back", we get some awesome passages that feature the greatest choir arrangements on the album. However, this song also has the worse chorus I've heard in 2013. This is disappointing, to say the least. Fans of Carptree and different progressive metal will enjoy this outing, but don't expect a masterpiece or even something you'll remember by 2014.